Observed in mid afternoon at Iten, Kenya, Dec 2015. 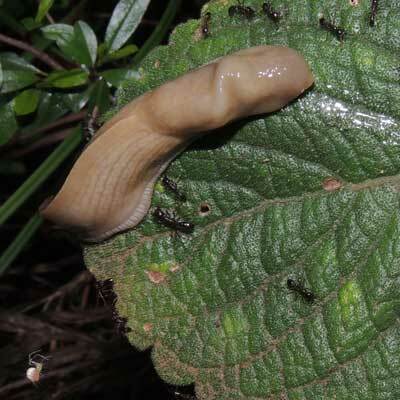 This giant slug is losing to the ants on two counts. 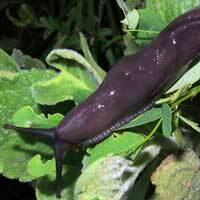 Slugs, like all snails, travel by gliding along on a layer of their own mucus. The supply is nearly exhausted. Now at the end of a leaf, the slug might let go but will fall into even more ants on the ground. Notice at lower left a small spider whose guy lines will be severed, again causing the prey to fall to the soil surface below. 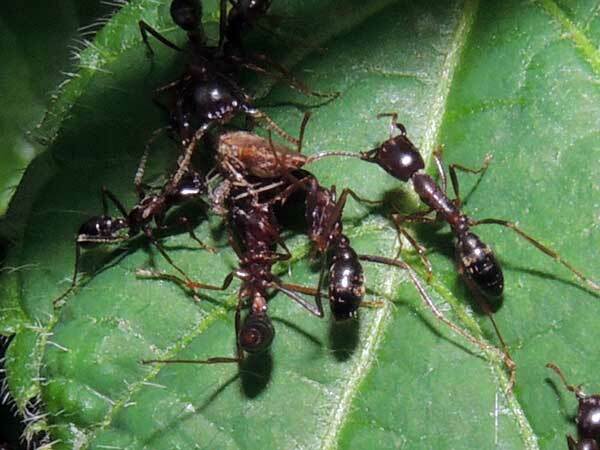 The animals below were all driven from their habitat by the driver ant raid described here. Notice that the spiders have lost one or more legs in their struggles to escape. 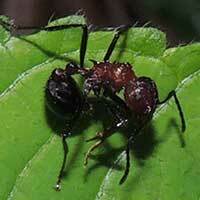 Other ant species are fair prey. Driver ants cannot see where they are going - they lack functional eyes. The massive columns to which these fast-moving ants belong are driven mostly by sense of smell - i.e. chemicals in the air. 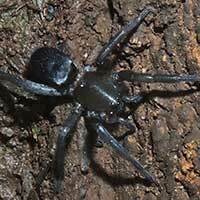 Be it water, prey, rival colonies of ants or potential enemies, the scent will reveal. I was able to observe for nearly an hour this raid that was underway from around 3 p.m. in the afternoon. 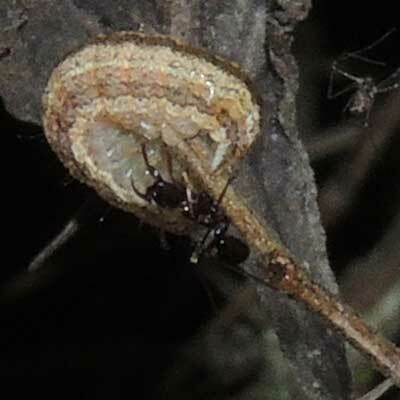 A great variety of invertebrates were seen succumbing to the attacks. 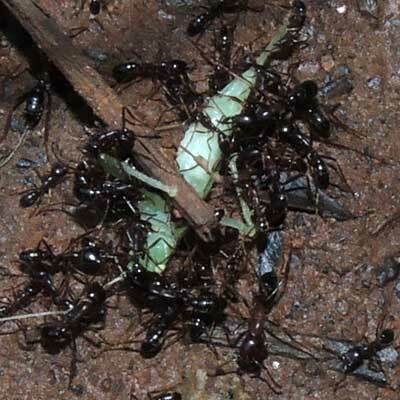 As animals are encountered on the soil or plant they are bitten or stung at which they flee up the stems while the ants continue their pursuit. 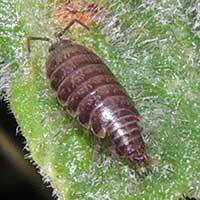 Eventually they reach a leaf tip. It they remain they are stung and quickly dismembered. 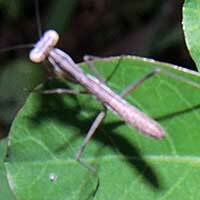 If they drop off the end of a leaf, they land on the soil below where even more ants await. 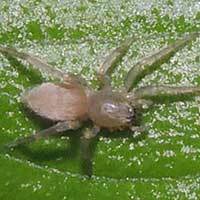 Spiders are vulnerable ... silken retreats are torn open and guy lines of aerial webs are cut loose from supporting vegetation. The hordes of driver ants on the ground respond to a rain of victims from above. After falling to the ground this katydid was overwhelmed by the drivers. This cutworm larva was forced out of its hiding spot in the soil. 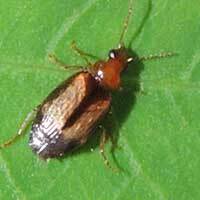 This is often a pest species, so a farmer might see the drivers ants' predation as beneficial. Another spider is struggling at upper right. Copyright Michael J. Plagens, page created 18 January 2016.